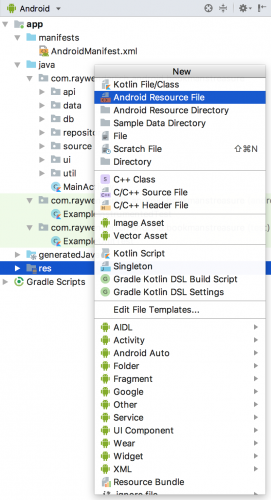 Learn Android development in Kotlin, from beginner to advanced. 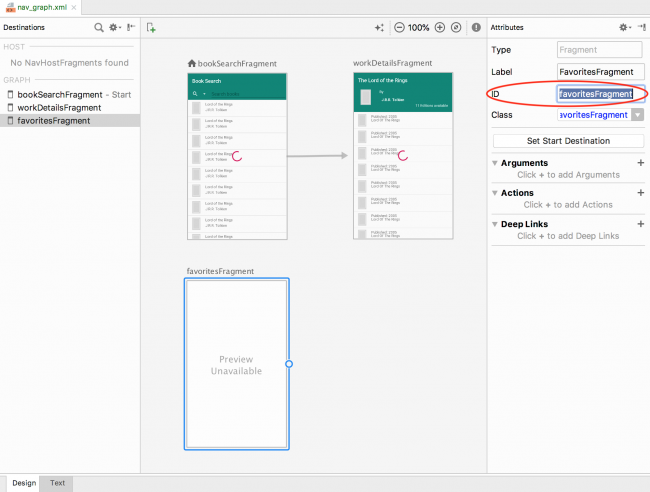 In this tutorial, you’ll learn how to use the Navigation Architecture Component, which simplifies the implementation of navigation in Android apps. 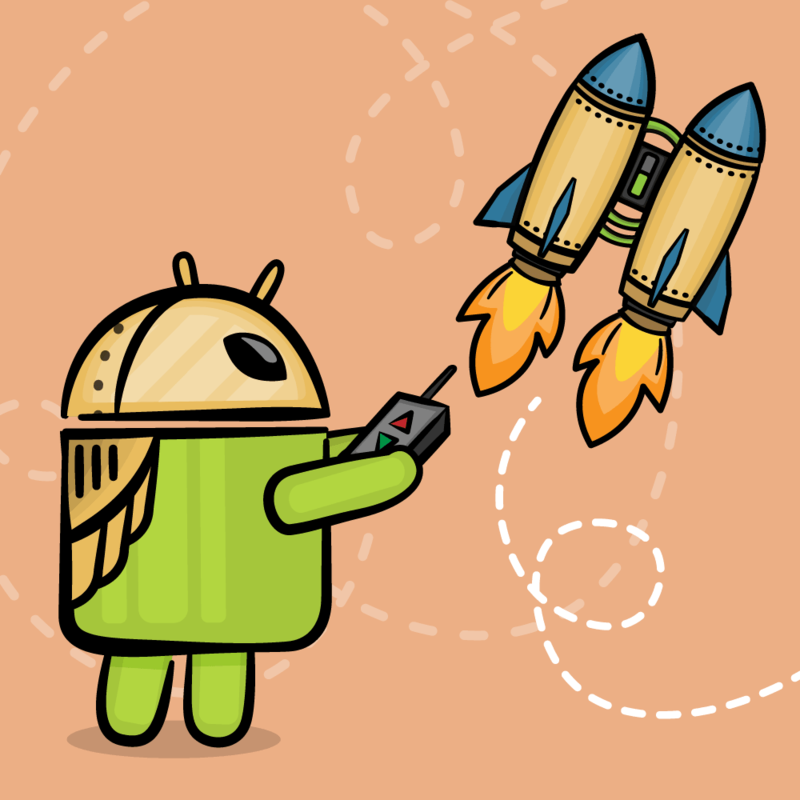 Among other goodies, Android Jetpack comes with the Navigation architecture component, which simplifies the implementation of navigation in Android apps. 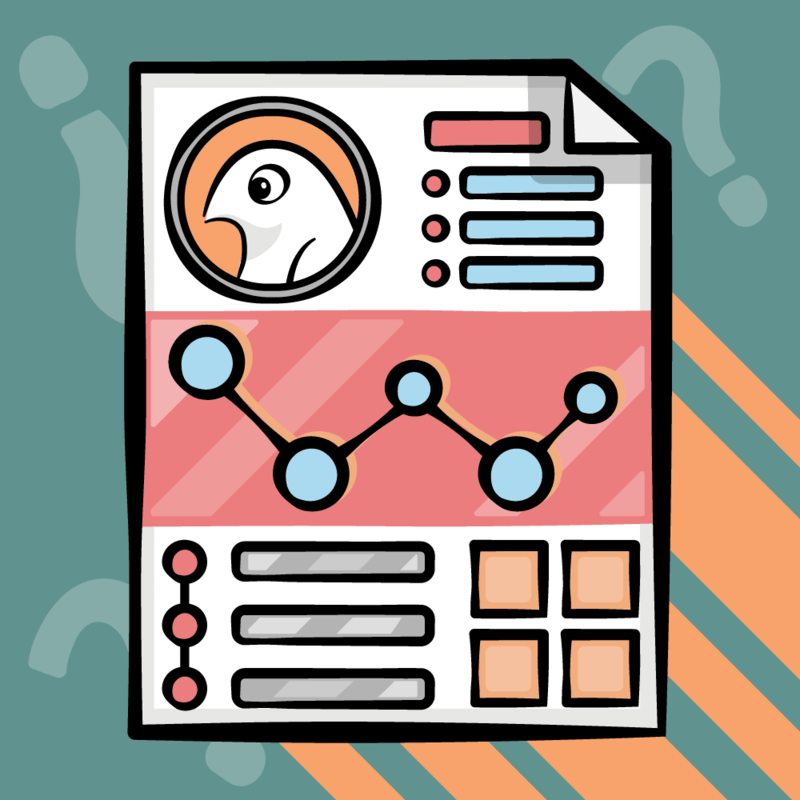 Navigation graphs and nested graphs. How to pass data between destinations. The Navigation architecture component is still in early development, but it is already proving to be a powerful and handy tool, as you will see for yourself. 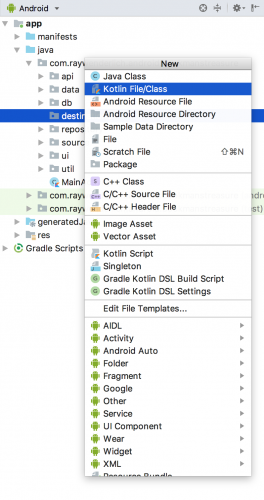 Note: This tutorial assumes you know the basics of Android development with Kotlin. 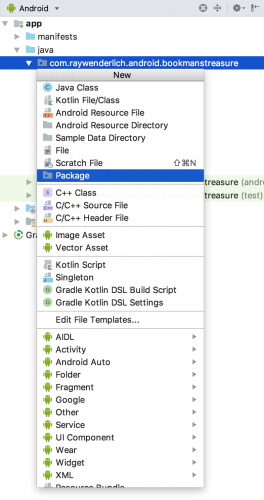 If you are new to Kotlin, check out our Kotlin introduction tutorial. 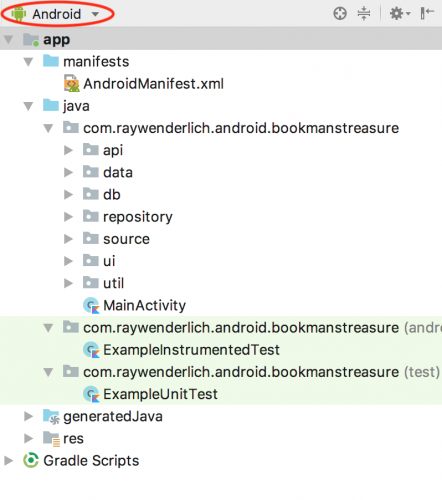 If you are new to Android development, check out our Android Tutorials first. Why Do You Need Yet Another Component? The app should have a fixed start destination. 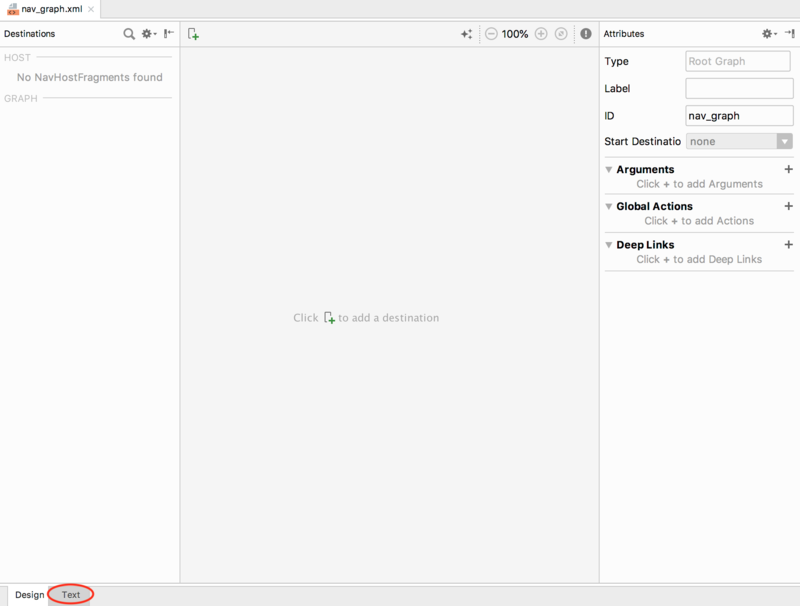 A stack is used to represent the navigation state of an app. The Up button never exits your app. Up and Back are equivalent within your app’s task. Deep linking to a destination or navigating to the same destination should yield the same stack. By using the Navigation architecture component, you provide a consistent and predictable experience to users — hassle and boilerplate free. To use the Navigation architecture component, you must use Android Studio 3.2 or higher. Install it by following the instructions in our Beginning Android development tutorial. Make sure to install the latest stable release. Next, download the materials for this tutorial using the Download materials button at the top or bottom of the tutorial. 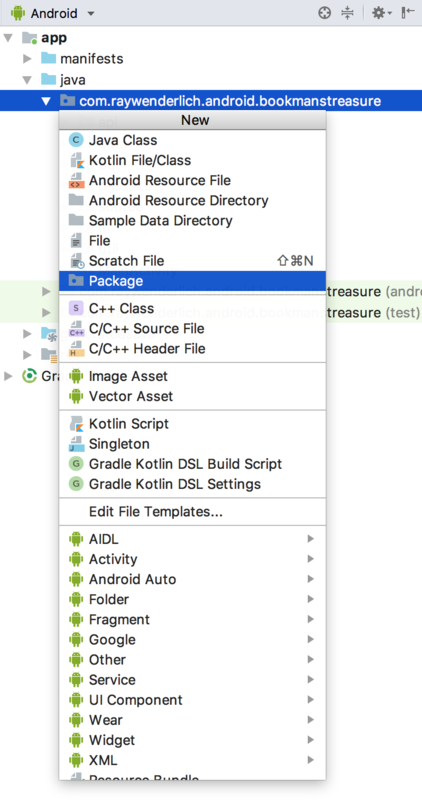 Open Android Studio and import the starter project with File ▸ Open. Find the location where you extracted the starter project, highlight the root folder of the starter project, and click Open. The sample project is named Bookmans Treasure. Once the project is synced, build and run it. 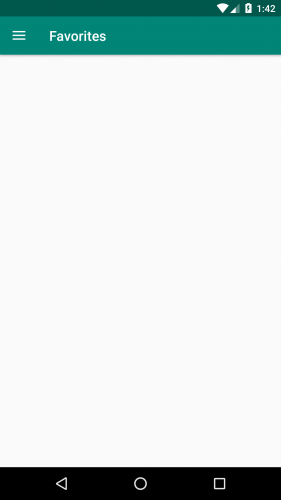 If you see a blank screen, you’re on the right track. Wondering about the -ktx suffix in the library names? 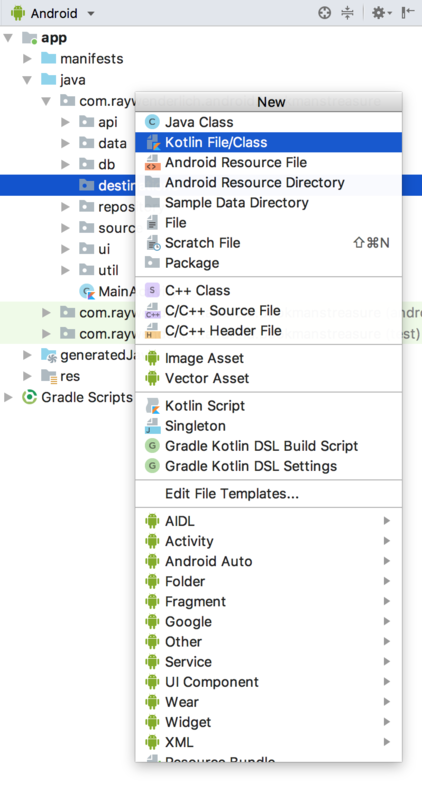 It signifies the Android KTX libraries that are super nice to use with Kotlin by making your code both more consise and readable. Sync the project. Then build and run the app again. It’s still blank, but hold tight — you are now ready to start working on the screen navigation. The above represents the navigation graph for the Bookmans Treasure app. Nodes represent the screens and arrows show how you navigate between them. You’ll add the navigation graph to the app now. 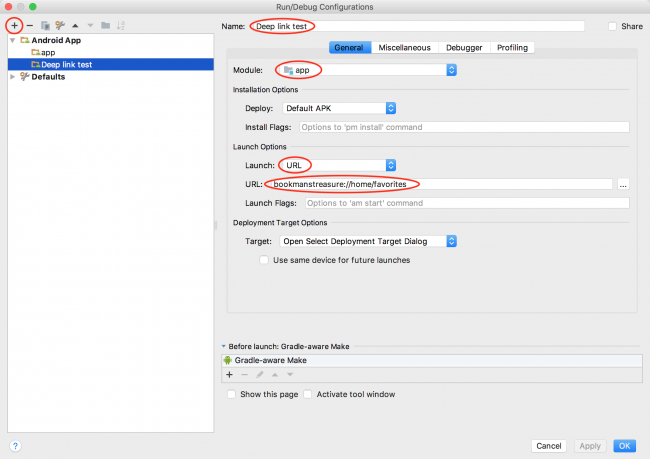 Click OK and then restart Android Studio. 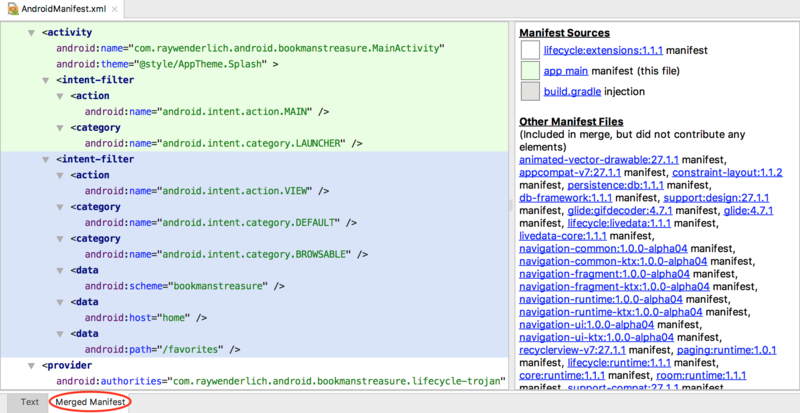 Now be sure Android is selected in the Project navigator. 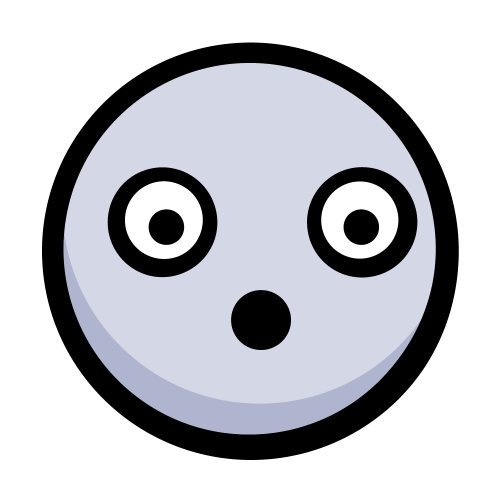 Click on the res folder, press command+N (on Mac) or Alt+N (on PC) (or File ▸ New) and select Android Resource File. 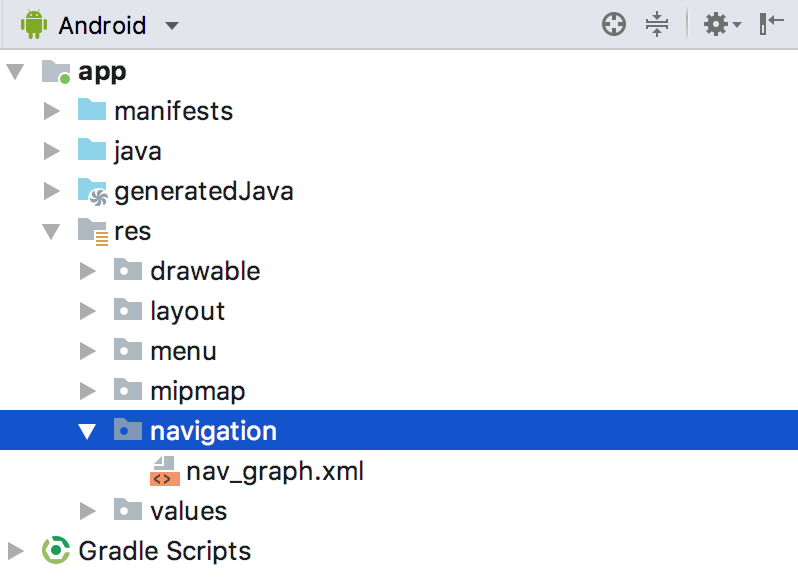 Android Studio will create a new resource directory called navigation with a new file named nav_graph.xml. This is where your navigation graph will live. Opening nav_graph.xml, you can toggle between the Text editor and the Navigation editor by clicking the tabs at the bottom of the editor window. Click on the Text tab to open the XML editor. Each destination represents a screen you can navigate to. By default, the Navigation architecture component includes support for Activities and Fragments. You’ll learn how to add custom types later in this tutorial. 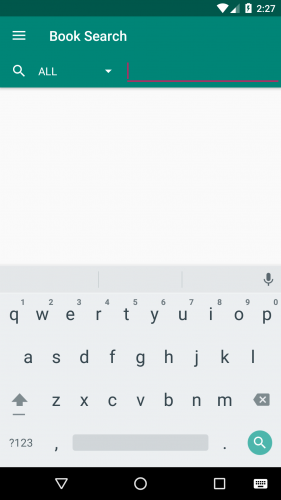 android:id: A unique resource name for this destination. android:name: A fully qualified class name. 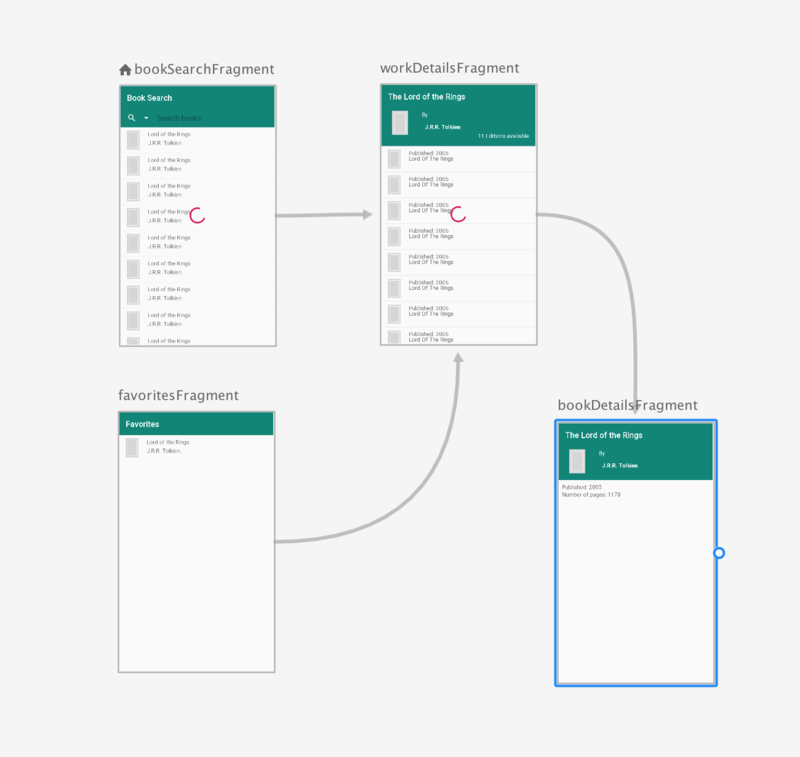 tools:layout: The Fragment layout, rendered by the Navigation editor. Build and run the app. Getting fed up with the blank screen yet? 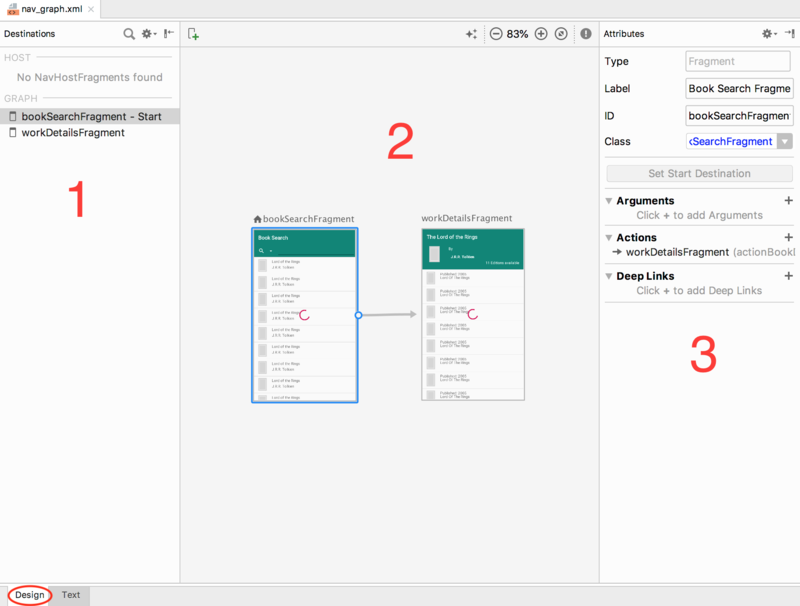 If the app namespace yields an error, follow the same set of steps you used above for the tools namespace to fix it. Build and run to make sure there are no errors. Seriously — blank screen, again? You’re missing one more thing: the NavHost interface. The NavHost interface enables destinations to be swapped in and out. The Navigation architecture component provides a default implementation: the NavHostFragment. 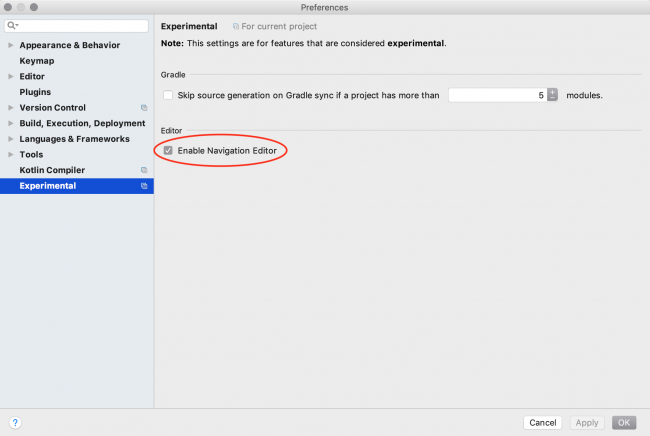 app:navGraph: Specifies which navigation graph will be associated with the navigation host. app:defaultNavHost: If set to true, the navigation host will intercept the Back button. Now, build and run the project. No more blank screens! 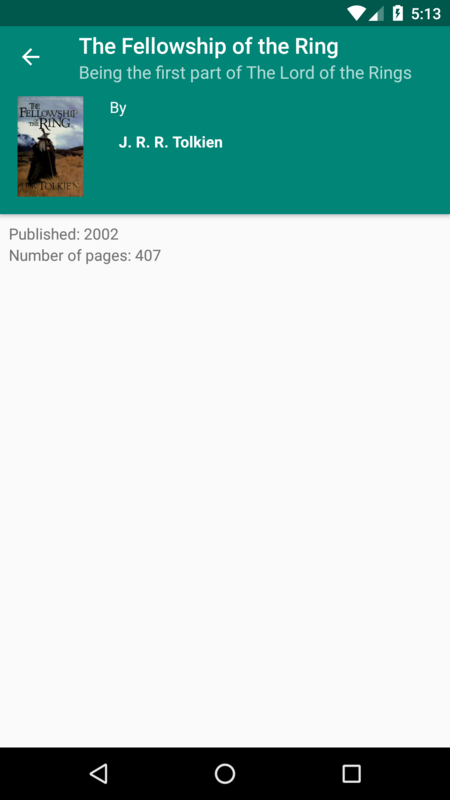 This will be used to show book details, such as the author name, title, list of editions, etc. android:id: The ID uniquely identifying this action. app:destination: The ID of the desired destination. You’ll learn how to pass arguments between destinations shortly. First, add more destinations using the Navigation editor. 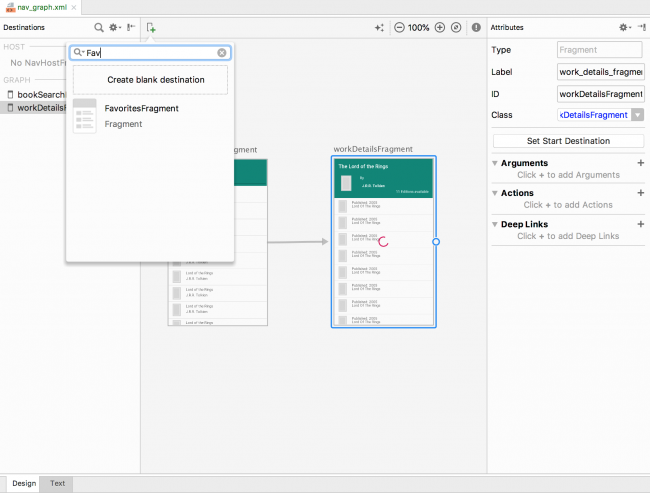 So far, you’ve added destinations and actions using XML. Now, you’ll get familiar with the Navigation editor. Open the nav_graph.xml file and click on the Design tab at the bottom of the editor. Add another destination to the graph. Click on the icon with the green + sign at the top of the graph editor. 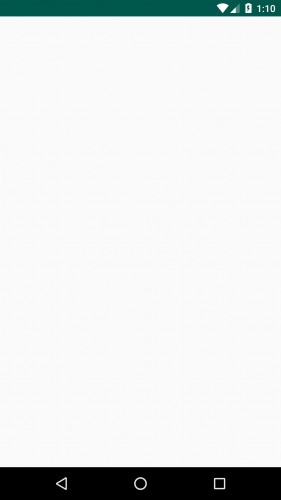 Start typing favorites and select FavoritesFragment from the list. You can edit the properties of the new destination using the Attributes editor. Set the ID to favoritesFragment. In the editor, hover your mouse over the dot on the middle of the right side of favoritesFragment. Then, press and hold, and drag the line to the workDetailsFragment. 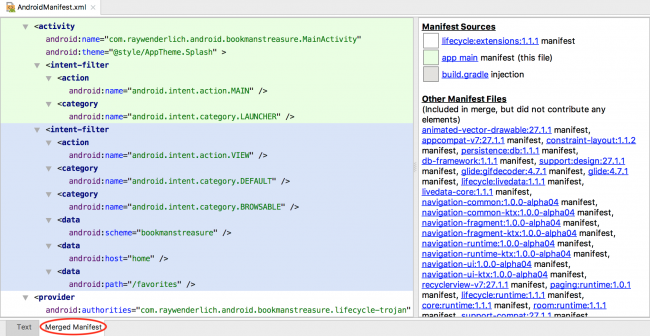 This creates a new action, navigating from FavoritesFragment to WorkDetailsFragment. Make sure the action (the line with the arrow) is selected in the editor and set the action ID to actionBookDetails. Build and run the app to make sure there are no errors. 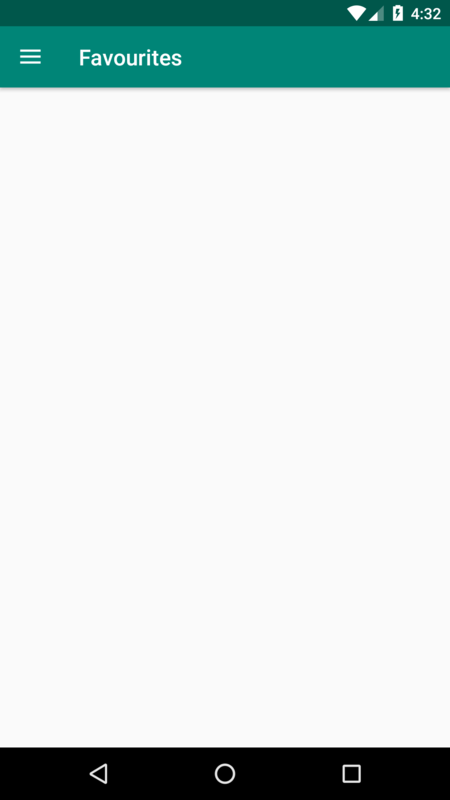 If you’ve toggled the navigation drawer, you might have noticed the Favorites menu item. The Navigation controller assumes the menu IDs are the same as your destination IDs and therefore knows what to do when an item is selected. How easy was that? 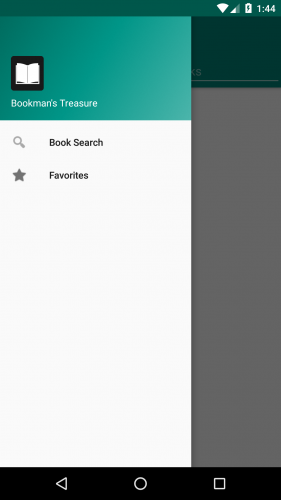 You can return back to the Book Search using either the back button or the navigation drawer. You often need to pass data between your destinations. Remember @+id/actionBookDetails you added earlier? 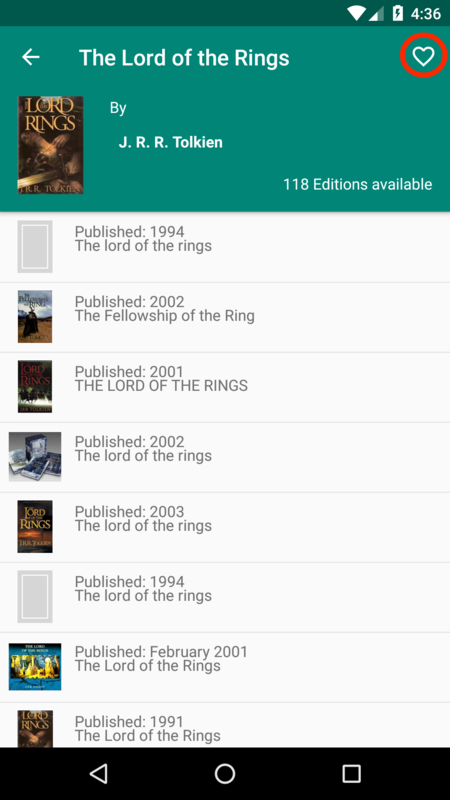 Currently, it opens the correct screen but shows no details for a selected book. You'll fix this, now. Note: The it argument is the data class Book, containing general book information. 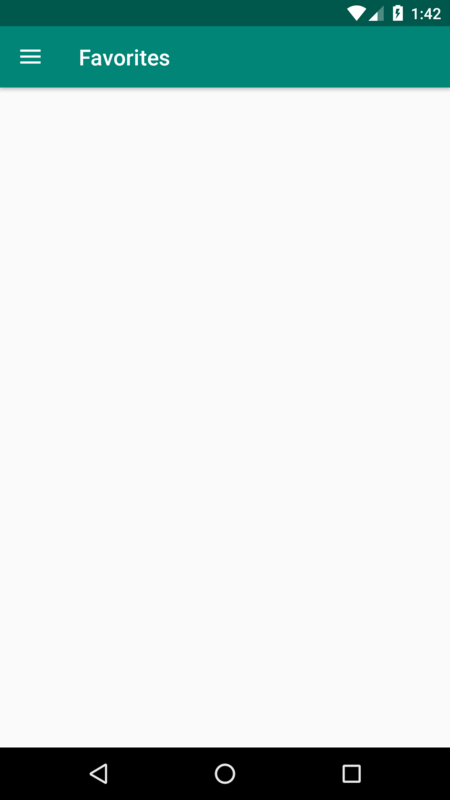 it is the implicit name within a lambda expression with only one parameter. Check the documentation to learn more. Build and run the app. 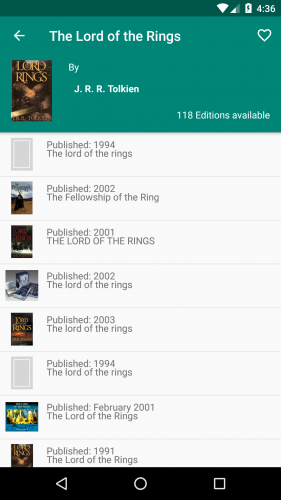 Search for a book, check its details and select an edition. You should see the edition details. enterAnim: Resource ID of the animation to use for the incoming destination. exitAnim: Resource ID of the animation to use for the outgoing destination. popEnterAnim: Resource ID of the animation to use for the incoming destination when popping the backstack. popExitAnim: Resource ID of the animation to use for the outgoing destination when popping the backstack. Build and run the app. Search for a book, click on one of the results and see the animation in action. The Navigation architecture component supports Activities and Fragments out-of-the-box, but you can also add custom types. 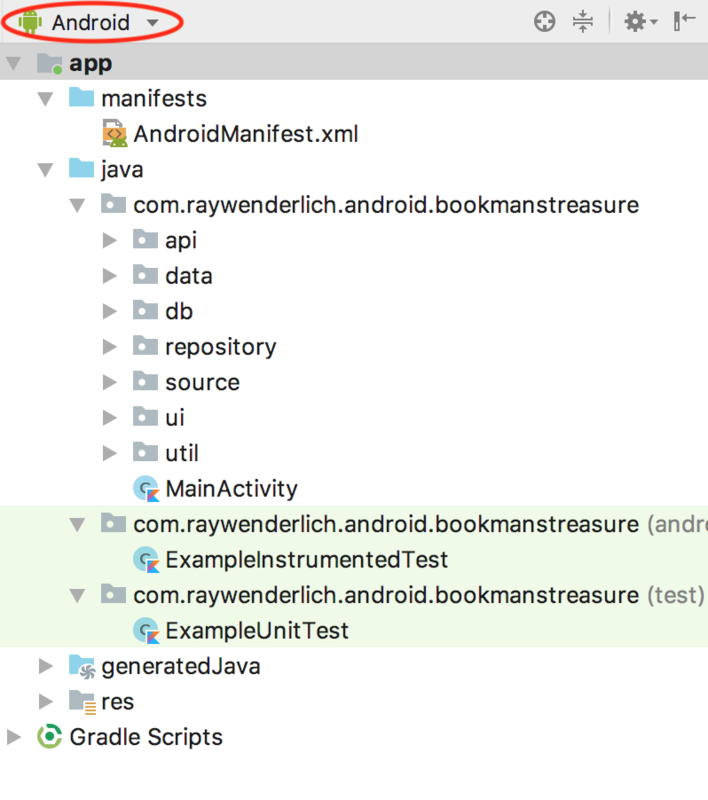 Check the com.raywenderlich.android.bookmanstreasure.ui.authordetails package. 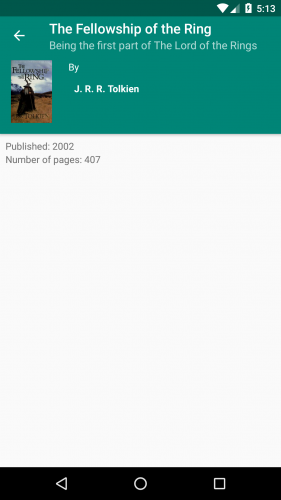 The AuthorDetailsDialog class can show the author details. You'll put it to use and add support for DialogFragment destinations. To add a custom destination, you have to implement the Navigator interface. You pass it to the NavigationController when initializing the navigation graph. 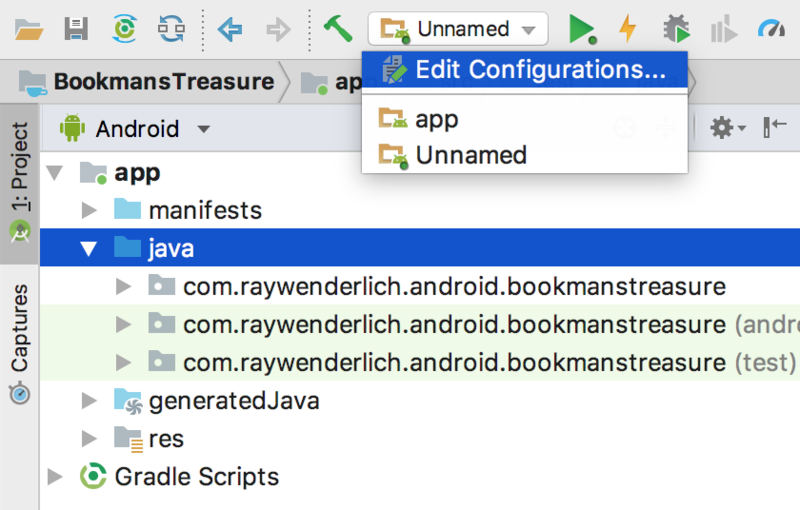 First, create a new package at the root level called destinations, by clicking on the com.raywenderlich.android.bookmanstreasure package in your project explorer, then press command+N (or File ▸ New) and select Package. 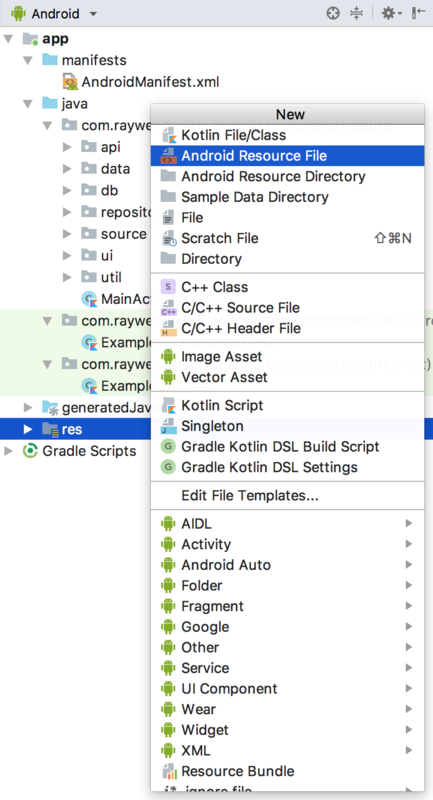 Type "destinations" in the dialog and click OK.
Click on the new package then press command+N (or File ▸ New) and select Kotlin File/Class. Under name, enter AuthorDetailsNavigator and click OK. Here, you declare the name of the tags that you will use for your custom destinations using the @Navigator annotation. The name is what you will add to the nav_graph.xml file the same way as you did for fragment destinations. You also extend the Navigator abstract class. navigate() is the Navigator function that performs the navigation to your destination. This is the function that instantiates your type of destination. This function navigates back through the back stack. You can ignore it in this case and return false. 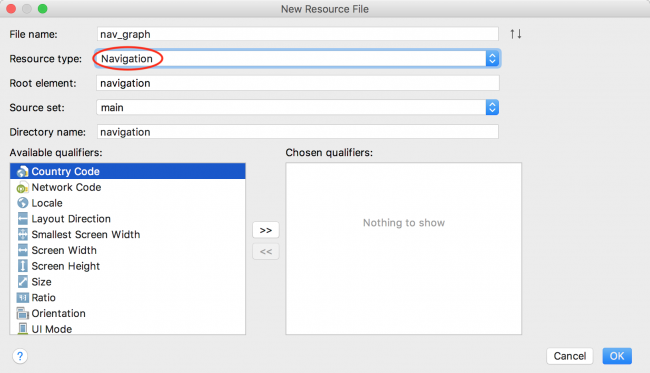 This nested class holds the data for your custom destination. Its task is to parse all attributes in your destination tag and store them. The function creates a new instance of the AuthorDetailsDialog, sets the Bundle as the dialog arguments and shows it using the FragmentManager. In these additions to MainActivity, aside from adding your custom destination, you also inflate the nav_graph.xml file yourself. This ensures the custom author attribute name is recognized. Finally, open activity_main.xml and remove the app:navGraph="@navigation/nav_graph" attribute on the NavHostFragment fragment tag. If you don't, the app will crash. Build and run the app. Search for a book, open its details and tap on the author name. If a dialog opens, you're winning! 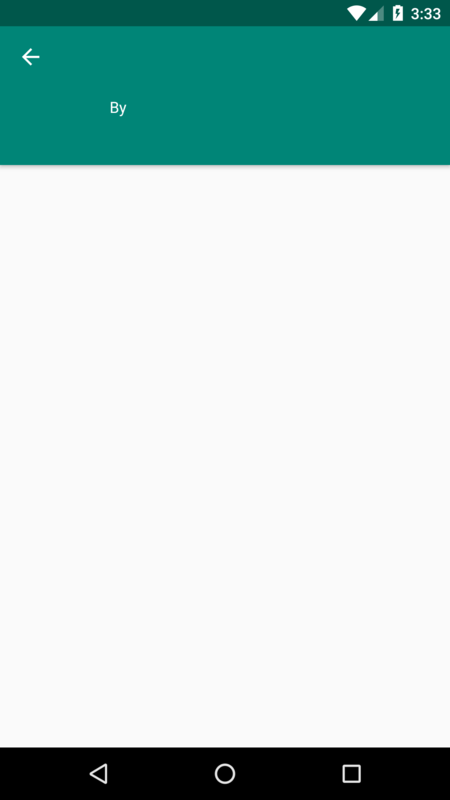 To reuse actions, you can declare them outside of any destination tags. Such actions are called global actions. You'll now make showing author details a global action. Build and run your app. 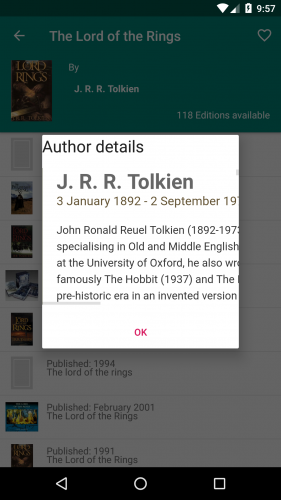 Now, you can open author details from both the Work details and Book edition details screens. Deep links are URLs that link to a specific screen or content of your app. Your next task is to create a deep link to the Favorites screen. 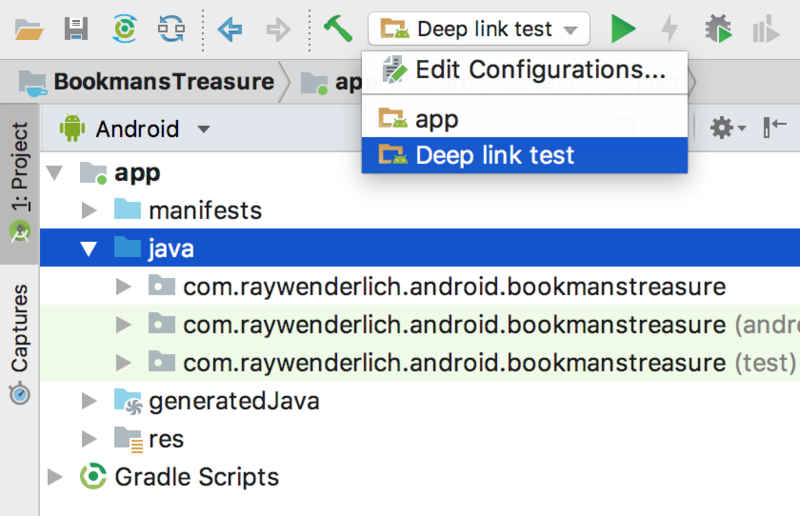 To test deep links, you'll create a new Run configuration for the app. Under the Run configurations dropdown, select Edit configurations... option. 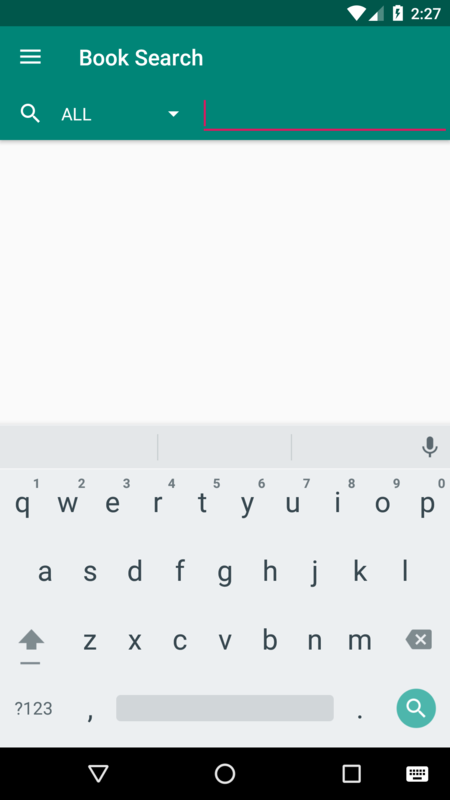 Click on the + button in the top-left corner and select Android app from the list. 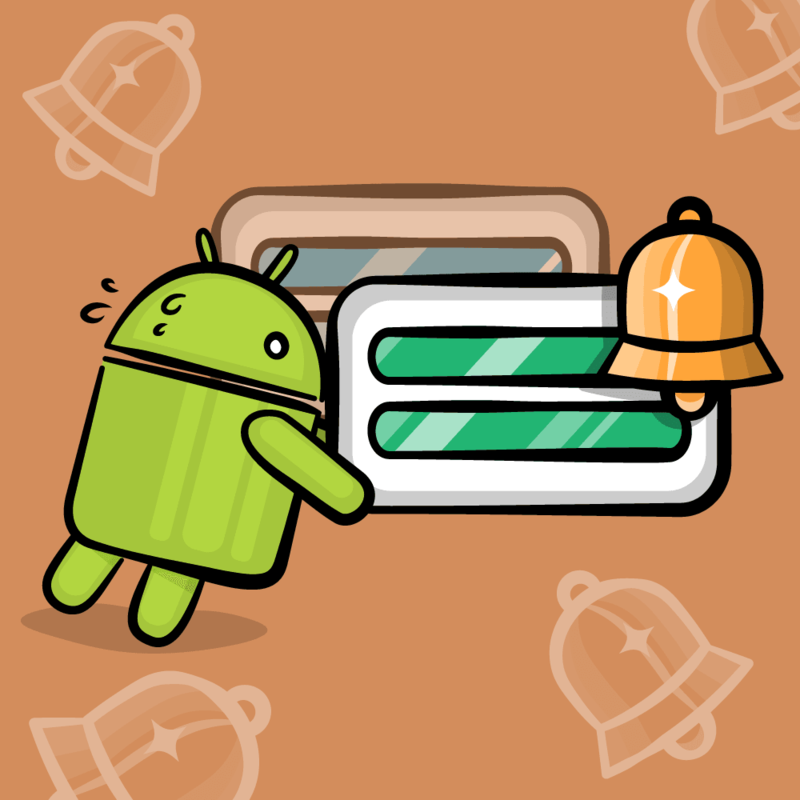 This will create a new empty Run configuration for Android app. Under Name, enter Deep link test. Now, click on Apply and then OK. Select the new configuration from Run configurations dropdown and run it. The app should open the Favorites screen. To enhance readability and reusability, one navigation graph can be embedded into another. 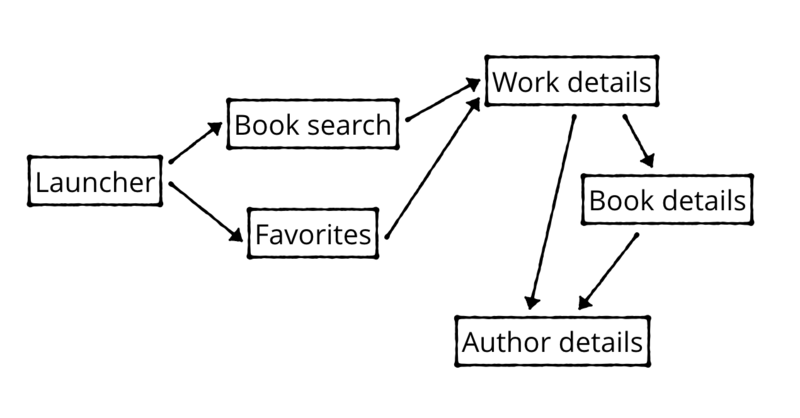 Create a new navigation graph named book_nav_graph.xml - use the same steps you used as when creating nav_graph.xml. workDetailsFragment is set as the start destination. 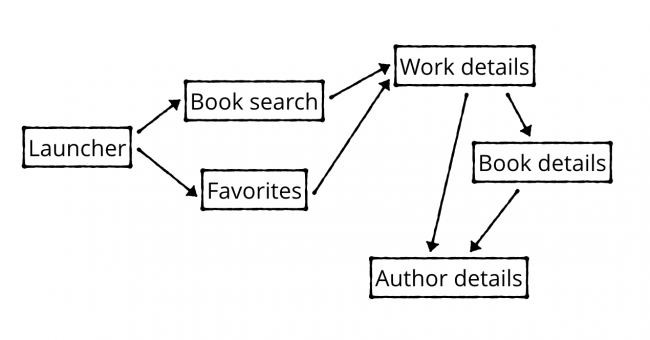 The ID of the nested graph has been set to bookDetailsGraph. Note the ID change — you're now pointing to the nested graph. 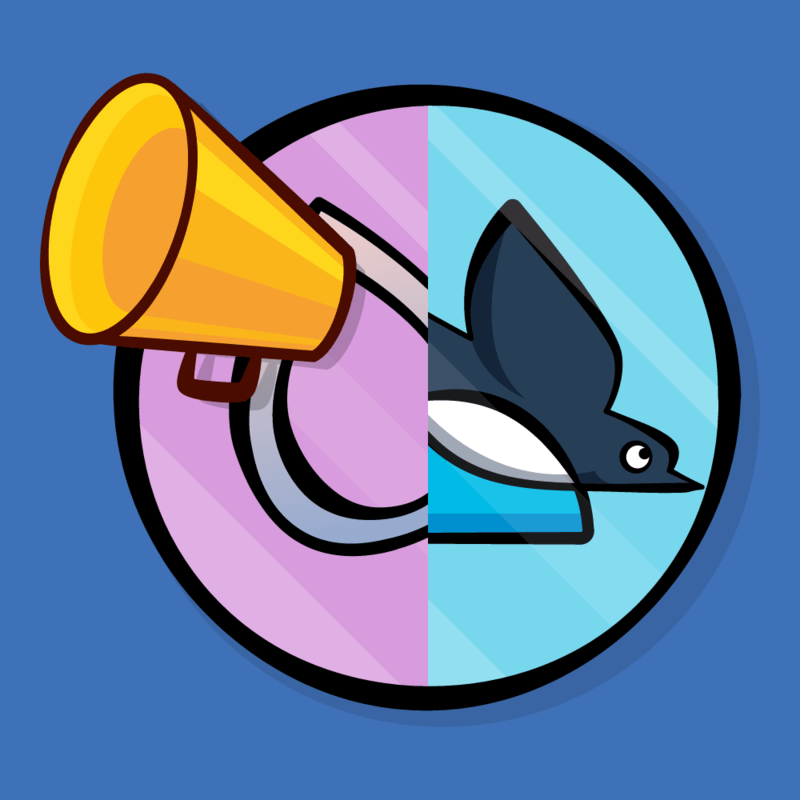 Do the same for FavoritesFragment, then build and run to make sure everything still works! The last remaining task is to open the Favorites screen if any books have been favorited. The XML should feel familiar – it's a fragment destination with two actions. This will check if there are any favorites and show the appropriate screen. Note the third argument passed to the navigate() function. It specifies navigation options. In this case, it clears the backstack to prevent the user from navigating back to the LauncherFragment. 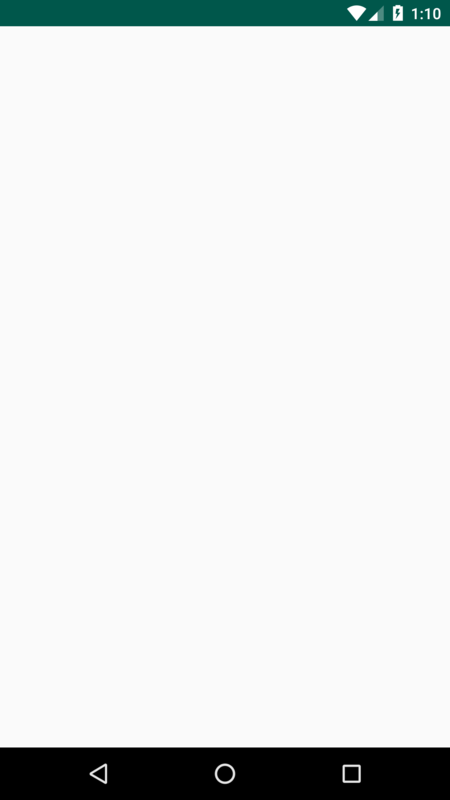 Note: For a list of all the options available, check the NavOptions.Builder official documentation. Now, build an run the app. Search for a book, tap on one of the results and add a favorite by tapping on the ❤︎ icon on the top-right. Exit the app, then launch it again. You should land on the Favorites screen. You can download the final project using the Download materials button at the top or bottom of the tutorial. Now you know how to use the Navigation architecture component! Even though it is still in beta, it eases development quite a bit. A great place to find more information is the official documentation from Google. Also be sure to check out our screencast on the topic. If you have any questions or tips for others on using the Navigation architecture component, please join in on the forum discussion below!